The holidays are truly a magical time of year, for everyone does their best to keep the spirit of the season in their hearts. People are oftentimes more generous, forgiving and peaceful during the next several weeks as we all bustle to and fro making merry with family and friends. Purchasing gifts for our loved ones is a large part of the holidays too and I've recently discovered that what you choose to put on your shopping list can go a long way towards making hard-working folks' lives much better. Fair Trade USA is an organization that certifies Fair Trade products for sale here in the United States. Only products that meet strict international Fair Trade standards earn the right to display the Fair Trade Certified label. These standards support Fair Trade USA's mission to foster increased social and economic stability, leading to stronger communities and better stewardship of the planet. This year, be cognizant of your own purchasing power and choose thoughtful and selective Fair Trade Certified gifts. Keep reading to learn more as well as view the "12 Days of Fair Trade" holiday gift guide! Each time you purchase a fair trade product, you help support families and causes all over the world. Visit FairTradeUSA.org for a detailed list of vendors who carry only Fair Trade Certified goods! Fair Trade is buying quality products that improve lives and protect the environment. Your everyday purchases, a cup of coffee or tea, a chocolate bar or a banana, can help farming families in 70 countries get fair prices to help them keep their kids in school and protect fragile ecosystems. Fair Trade is just that - trade, not aid. It is supporting hard-working people who grow and sew the products that we love. It's helping them to help themselves. Fair Trade is a growing movement that helps to alleviate poverty in the developing world. Fair Trade USA is a nonprofit, mission-driven organization that tackles social and environment sustainability with an innovative, entrepreneurial approach. They are the leading independent, third-party certifier of Fair Trade products in the United States, and the only U.S. member of the global Fairtrade International network. This season you can make every gift matter by purchasing presents that spread holiday cheer, not only to your loved ones but also to farmers and workers around the world. Our annual Holiday Gift Guide provides meaningful suggestions for everyone on your list. Sing with us as we take you through the 12 days of a Fair Trade Christmas. Nothing says I love you like the gift of coffee. It will keep your special ones warm and awake! Coffee makes a great stocking stuffer or hostess gift and you can give knowing that your present brings hope, education and economic stability to coffee communities around the world. Here are some especially delightful Fair Trade beans that are perfect for this festive season: Green Mountain Coffee Fair Trade Organic Coffee Sampler, Mr. Espresso Organic Ethiopia Yirgacheffe, Café Femenino Asobagri Huehuetenango Blend, Equator Coffee Ecuador El Batan, Fidalgo Bay Yuletide Roast, Pachamama Cooperative Harvest Blend, Grounds for Change Holiday Blend, Allegro Coffee Organic Mexican Zaragoza Select, Organic Red Barn Blend,Hammerhead Coffee Roaster’s Extra Special Blendand Weaver's Holiday Blend. And you can’t go wrong with Thanksgiving Coffee’s Perfect Gift Basket. There is never a better time to give the gift ofchocolate than during the holiday season, and the gift of Fair Trade Certified chocolate is sure to delight. Make sure to tell the recipient that this special chocolate was grown and harvested in socially responsible ways that help communities to grow and flourish. Look for these delicious chocolate treats:Divine Milk Chocolate Advent Calendar, Sjaaks Winter Wonderfuls, Alter Eco Dark Mint Chocolate, Angell Organic Candy Bars, Green and Black's Hazelnut & Currant, Sweet Riot Ultimate Holiday Cheer Gift Cube,Coco Zen Chocolate Chai Spice Truffles, Kopali Organics Chocolate Covered Coffee beans and Sweet Earth's Hanukkah Gelt. Can’t get enough Fair Trade Certified chocolate? Bake it in a cake withSimply Organic Devil’s Food Cake Mix. Baking during the holidays is one of the tastiest traditions there is and with Fair Trade ingredients it can also be one of the most fulfilling. Invite friends and family over for a baking party, or put together a gift basket that includes all the ingredients needed to whip up your favorite baked goods. 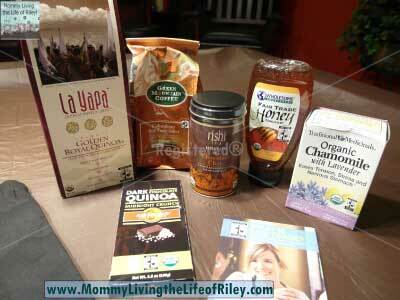 Here are some Fair Trade Certified ingredients that everyone will want to add to their pantry: Wholesome Sweeteners Sugar, GloryBee Honey Squeeze Bear,Casacao Cacao Powder, Guittard Extra Semisweet Chocolate Chips, SunSpire Semisweet Baking Bar,Frontier Cinnamon Sticks, The Spicy Gourmet Ceylon Cloves and Frontier Ginger. The only thing better than gifting a great new piece of clothing, is gifting clothing with a unique story. Whether it’s a shirt, scarf, or even a pair of undies, the receiver of your gift will have the joy of knowing that the product was made produced by farmers and factory workers that were treated fairly. Here are a few gift ideas for everyone in the family: HAE Now Baby onesie, Prana Soul Tee, Tompkin’s Point Men's Polo Shirt, Good & Fair V-neck Story Tee, Good & Fair Men’s Boxers,Maggie's Organics Ruched Scarf and Mother Tongues Ubuntu T-Shirt. The holiday season is a great time for trying out new wines and spirits, and there are a lot of great Fair Trade Certified options to choose from. These make great gifts for the adults in your life, from your co-workers to your in-laws and are a great addition to holiday cocktail parties – can you think of a better conversation starter? Sip stylishly and sustainably by serving these Fair Trade spirits and wines that will have you and your loved ones rockin’ around the Christmas tree: Cantora Carmenere Cabernet Sauvignon (available at Whole Foods Market), FAIR. Quinoa Vodka, FAIR. Cafe Liqueur , Heritage Link One World Pinotage, Neu Direction Malbec (available at Sam's Club). Fair Trade Certified grains make a special gift for the chef in your life, and they are a unique complement to many homemade dishes with their interesting textures and beautiful colors. Every bite matters when you add Fair Trade quinoa and rice to your holiday menu; you can serve each plate knowing that you are supporting community development efforts in rural communities. Look for these grains when filling your shopping cart: La Yapa Red Royal Quinoa, Alter Eco Purple Jasmine Rice, Alter Eco Rainbow Quinoa and Alter Eco Ruby Red Jasmine Rice. Once the holiday parties have passed, there is nothing better than cleansing the body of all the holiday treats with a healthy and delicious piece of fruit. Fruit baskets make a great gift, and buying Fair Trade Certified fruit ensures that farmers are given opportunities to improve their lives and their communities. Give the gift of health and hope this season by purchasing Fair Trade Certified mangos, bananas and pineapples! Fair Trade Certified sports balls!? Yes indeed - these balls ensure safe working conditions and fair wages for ball stitchers, and they make the perfect gift for any sports enthusiast in your life. Now is the time to start thinking about how you are going to wrap that awesome Fair Trade Sports Football or a Senda Soccer Ball. Give a gift that changes the world by improving opportunities for farming families and protecting the environment. Your generous gift is a donation to Fair Trade USA that helps isolated farmers and workers get the training they need to join the global economy on Fair Trade terms. Your gift recipient will receive a beautiful personalized eCard letting them know that you are giving to others in their name and in the true holiday spirit! Start giving today and know your gift is aGift of Fairness. You can't go wrong with Ben & Jerry's Milk & Cookies ice cream for Santa! This delicious flavor, made with Fair Trade Certified sugar, cocoa and vanilla, is all the fun without the crumbs! Watch Ben & Jerry's new documentary series Fair Trade Uganda to learn more about Fair Trade vanilla. For more info about Fair Trade and the products available visit www.FairTradeUSA.org . 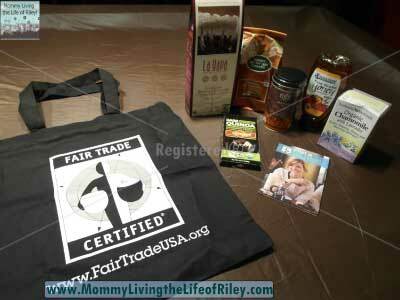 Disclosure: I received the sampling of products shown above from Fair Trade USA in order to facilitate my review. No other compensation was received. This product review is based on my own personal experiences with this item and is completely honest and objective.